If you think safety is something that will take care of itself, you should stop and think. You enjoy racing, right? Then if you neglect safety concerns, it could seriously affect your ability to race in the future. With that in mind, here are simple tips that will help you play it safe this racing season. One of the most dangerous situations a driver can put himself in is to be the wick in an explosive situation. A severe burn can be life threatening or career ending. 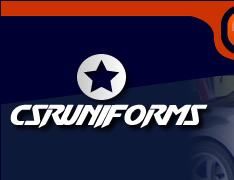 Before each season, inspect your firesuit. Look for anything that would cause it to be less protective. Oil or grease on the suit is a lightning rod for fire. The suit should be washed and clean. Does the firesuit have tears in the fabric? Tears or patches repaired without Nomex or similar thread will burn quickly, leaving you exposed. 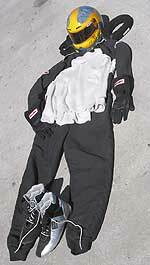 Some types of suit fabric can lose their flame-retardant characteristics after many washings; Nomex isnÂ’t one of them. Check with the manufacturer for washing or dry cleaning instructions. A firesuit doesnÂ’t have to be new, but it should be in good condition. Check it carefully. If it doesnÂ’t seem to be good enough, then thumbtack it to a wall in the shop as a trophy. Get a new one with two-layers if at all possible. The additional cost is worth the added protection. Hands and feet often suffer first in a fire. You donÂ’t have much choice where you put them when getting out of a burning car. Get SFI-rated gloves, socks, and shoes for added fire safety. Your helmet is another piece of equipment needing fire protection. Yours should have a Snell Foundation rating, for instance an SA-95. If yours has an M-95, that is for motorcycles. Remember, the interior lining is not a fire-retardant fabric. Now that you are satisfied with your fire protection gear, letÂ’s look at some potential sources of driver burns. The fuel tank is at the top of the list. Too often, many of us race with a plastic Â“fuel cell.Â” Even on short tracks, whether your rules require it or not, there should be a steel can with the tank inside. This fuel cell should also have a rollover vent. See where the fuel line runs through your car. It should not be in the cockpit area. If it is, it should be run inside a secured, larger metal tube. Another source of driver burns is often found in a Street Stock with an automatic transmission with an oil cooler hanging around in the cockpit area. Many times these cooler lines are made of rubber fuel line and are under only a small amount of pressure, but IÂ’ve seen them cut and pulled off. A hot liquid (250+ degrees F) can do as much damage as a burning one. All such cooler lines need to have metal separating them from the driver. Take a long look at your seat belts. They should be clean and not weathered. Look closely at places where belts come through the seat. There should not be any wear or abrasion marks in this area. Check the hardware mounting points for looseness. While you are there, take a good look at your seat mounting. This would be a good time to upgrade seat mountings. Use fender washers and Grade 5 bolts. A Grade 5 bolt has three marks on the head. Bolts with no marks are soft and should not be used. Follow the belt manufacturerÂ’s mounting instructions to the letter. Starting at the front, take a close look at the radiator hoses because old hoses may be weak. When replacing a hose, always ask for the premium hose. They cost more but they will be worth it when you come in from a feature win with an overheated motor and open the hood. Often, pressure builds after the engine is shut down. A blown hose is like an out-of-control steam cleaner and can burn off a few layers of skin. Also check the engine-cooling fan. Look for cracks or bent blades. If you have a steel hub, stainless steel blade, flex fan remove it from the car. Fatigue can cause the blades to crack and become shrapnel. Steel and aluminum race car fans, as well as plastic flex fans that give little trouble are available. Take a close look at the ball joints, tie-rod ends, and suspension mountings. Rod ends can be bent, causing front-end settings to be off the mark. Wear on ball joints is difficult to detect with a load on them. It is necessary to remove one of the ball joints so the spring is not loading the suspension. A lot of energy is stored in the spring so do this very carefully, making sure the spring cannot jump out. If you have weight jacks, you should be able to loosen the spring this way. Feel for vertical slack. Too much wear and the joint can separate into two pieces. This could cause you to crash. Your parts store should have a specification for allowable wear on your specific joint. Ducking underneath the race car, check the driveshaft. A large dent or other visible damage can cause it to vibrate, which can cause other parts to fail. Be sure you have a driveshaft loop in place. This will keep you from having that rising feeling if the front U-joint gives up and the driveshaft digs into the track. DonÂ’t forget the rear U-joint clamps. I have had them loosen up several times. Check your wheels, particularly if you are using OEM wheels, for cracks and damaged lug holes. If a wheel has ever been run with loose lugs, the holes have been damaged. Even if your track doesnÂ’t require it, use 1-inch lug nuts. Each week, put your race car on jackstands and crawl under it with a handful of wrenches. Put a wrench on every bolt and nut you can find. While doing this you will see bent or cracked parts before they fail and cost you a race or cause a crash. No.1 Check your personal safety equipment. * Firesuit. Is it OK? Clean? Gloves, shoes, socks? * Helmet. Does it have the correct rating? No. 2 Check the race car. * Fuel cell. Is it in a metal can with a rollover vent? * Fuel lines in the cockpit area. Are they doubly enclosed? * Transmission oil cooler lines. Are they separated from the driver by metal? * Seat belts. Are belts worn, frayed or weathered? Are the mountings secure? What date were they manufactured? * Radiator hoses. New? High quality? * Engine cooling fan. Correct type and good condition? * Suspension and steering parts. Inspect for wear and condition. * Under the car. Check U-joints and clamps. Check driveshaft for damage. * Check the wheels. Look for cracks and bad lug holes. Use 1-inch lug nuts.